Craig Taborn: "Every sound you make is a choice, and it's a choice made in relation to everything happening around you" - (DownBeat, May 2019). DJazz: Durham City Jazz Festival Launch - Courtyard Café, Palace Green Library, Palace Green, Durham DH1 3RN. 7:00pm. £5.00. Featuring Hand to Mouth: Lindsay Hannon & Bradley Johnston. JR Trio - The Globe, Railway Street, Newcastle NE4 7AD. 7:30pm. £6.00. (£3.00. student). Line-up: James Romaine (alto sax); Asaph Tal (double bass); Kai Chareunsy (drums). Birmingham Conservatoire student trio. Gig replaces Francis Tulip Quintet (to be rescheduled). Archipelago + Paul Taylor - Lit & Phil, Westgate Road, Newcastle NE1 1SE. Tel: 0191 232 0192. 7:45pm. £8.00. (£6.00. concs). JNE. Anth Purdy - Dormans Club, Oxford Road, Middlesbrough TS5 5DT. Tel: 01642 823813. 8:30pm. Free. Tees Hot Club: Dormans Jazz Festival. Joseph Carville Trio - Bar Loco, Leazes Park Road, Newcastle NE1 4PG. Tel: 0191 232 5871. 8:00pm. Free. Carville (piano), Allan Peat (double bass), Mark Rayner (drums). This was the third time in a week that I had attended a Jazz North East gig. The first two, Deep Cabaret and Malby, Bonnet & Darrifourcq, although completely different in content, were both absolutely superb. Could the last in the triumvirate match the variety and quality of its predecessors? I am very happy to report that it did so and in spades. 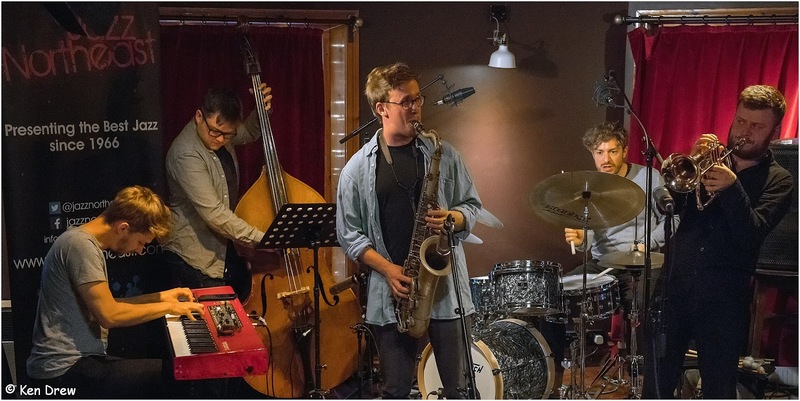 Although possibly the most conventional of the three, the jazz being of the ‘straight ahead’ type, the enthusiasm and the calibre of both the music and the performers made it another night to remember. All five were marvellous, from Hawkins’ very first tenor solo, Gift Horse, onwards. Will Barry on electric piano was fabulous and I would really love to hear him on a ‘proper’ piano such as a concert grand. Conor Chaplin, a frequent visitor to Tyneside, most recently with Laura Jurd’s Dinosaur, was brilliant particularly considering he was deputising for regular bass player Joe Downard (apparently he was on his stag night). Drummer Jay Davis kept things rockin’ all night and also contributed some very impressive solos. Although not wanting to single anyone out in such a fine quintet, James Corpus on trumpet and flugelhorn simply blew the audience away. If there is a more exciting and finer trumpeter currently on the circuit, I would be amazed. However, having praised all the soloists it was actually in the ensemble playing that I found the music most enjoyable. The tunes, all original, were catchy and well crafted. Hitchcock came over as a very charming and affable fellow when introducing the numbers. Two deserve a special mention because of their backstory. Wojciech is named after a Polish tobacco salesman who kept on delivering shots of top quality vodka to the band during a show in Krakow. After the gig he took them to a club and at some point revealed to the band a revolver on one hip and a full magazine on the other. Being a Brentford fan, Hamburg 2010 was a little more problematic, as it references Fulham’s UEFA cup final appearance in 2010 and in particular their fullback at the time John Pantsil who had a curious habit of doing a lap of honour before and after the game regardless of the result. As it happens, the Cottagers lost the final so I was still able to enjoy the tune. I did mention to Alex after the gig that if I had known he was a Fulham fan I wouldn’t have come to the gig which would have been more fool me for I would have missed a thoroughly entertaining and top class evening. CD Review: Alina Bzhezhinska - Inspiration. Don't forget your bucket and spade! Jam Session @ Dun Cow, Jesmond - May 23. Niffi Osiyemi Trio @ Jazz Café - May 18. Jam Session @ The Dun Cow, Jesmond - May 9. Brass Break Out - Budtet Break In! Jazz Café Jam Session - May 1. Jazz Lads - Saltburn Cricket Club, Marske Mill Lane, Saltburn TS12 1HJ. Tel: 01287 622761. 8:00pm. £5.00. Groove-a-matics - Billy Bootleggers, Nelson St, Newcastle NE1 5AN. 9pm. Free. Strictly Smokin’ Big Band: A Great Day in Harlem - Gosforth Civic Theatre, Regents Farm Road, Gosforth, Newcastle NE3 3HD. Tel: 0191 284 3700. 7:30pm. £15.00. (£12.50. concs). Joseph Carville Trio - Prohibition Bar, Pink Lane, Newcastle NE1 5DW. 8:00pm. Free (donations). Carville (piano), Allan Peat (double bass), Mark Rayner (drums). Boys of Brass @ Brandling Villa, Haddricks Mill Road, South Gosforth, Newcastle NE3 1QL. Tel: 0191 284 0490. 9:00pm. Free. No Time For Jive - Billy Bootleggers, Nelson St, Newcastle NE1 5AN. 9:00pm. Free. SouLutions - Brewery Tap, Wellington Road, Dunston NE11 9HS. Tel: 0191 447 4220. 9:00pm. £8.00. (Early Bird £5.00.). Dean Stockdale - Jazz Café, Newcastle Arts Centre, Westgate Road, Newcastle NE1 1SG. Tel: 0191 261 5618. 2:00pm. Free. Café Mezzanine (first floor, access via crafts shop).